Las Vegas is a tourist destination, and we are finding that victims of the recent shooting traveled to this event from all over the continent. Nobody was thinking about it at the time, but we have thousands of tourists being targeted in a state that allows for the mass purchase of military assault weapons. Driving to work this morning, I heard a Nevada legislator saying that his state’s gun laws are just fine, and it’s fun to shoot assault weapons at paper targets. I can’t imagine why it would be fun to use an assault rifle instead of a paper shredder, but there is very little risk that unsuspecting folks are going to be killed by a shredder available from W.B. Mason without a license or permit. I suspect this legislator would also find a significant drop in Nevada tourism wouldn’t be a fun thing to deal with, either. Given that Nevada’s very existence depends on tourism, a sudden and significant lack of visitors might make Nevada lawmakers rethink their position on guns. Not as a boycott to protest their laws, but a statement that folks really don’t feel safe in a state where they allow folks to haul around a couple of dozen assault weapons due to the idealogical zeal of the state legislature. The center ranked the state’s laws the 18th strongest in the nation, but that was only because of the passage of Question 1; before that vote, the center placed Nevada 27th. 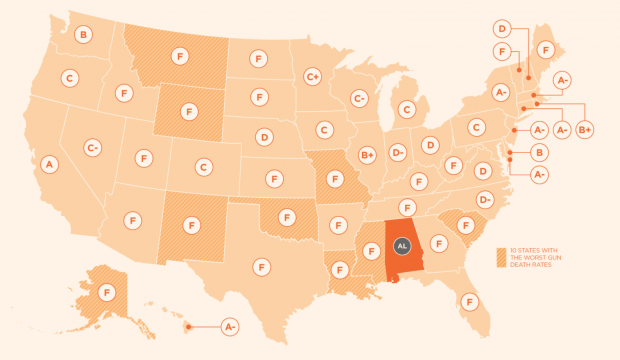 The center calculated the state’s gun death rate at 14.9 per 100,000 residents, or 14th highest among the 50 states. Question 1, a ballot measure that required that all firearm transfers except for those between members of an immediate family go through a licensed dealer and be subject to background checks, passed narrowly in the November election. Gov. Brian Sandoval and Atty. Gen. Adam Laxalt, both Republicans, opposed Question 1. After the election, Laxalt ruled the measure invalid. The measure required that gun dealers were required to perform their background checks directly through an FBI database; but the FBI has refused to make the database available to private parties. As a result, Laxalt ruled, the measure can’t be enforced. Perhaps it is time for us folks with a few bucks in our pocket, and a taste for travel, to look at a map like this and make travel plans accordingly. Florida is sunny and warm in the winter, but are you really safe in a state with such lax gun laws? California has sunshine and am A rating looks much safer than Florida’s F. Canada is lovely in the summer, and suddenly the cost of visiting Britian has dropped due to Brexit nuttiness. So, if the gun nutty legislatures won’t make their states safe for tourists, it’s time for tourists to make note of that fact and travel elsewhere. The map tells me something different. The map tells me that our legislators could tighten up MA gun laws and make us safer, right here at home. We have room for improvement, but I certainly feel safer here than I would in lots of other places. One of our problems is that we are next to two Fs and a D.